Emails Detail Arizona Governor's Relationship With Uber - Integration Through Media ....! (VOA): Emails released Wednesday between Arizona Governor Doug Ducey's staff and Uber executives shed new light on the relationship between the first-term Republican and the company whose autonomous vehicle recently was involved in a fatal crash. Accounts of the previously unseen emails released by the governor's office were first reported by The Guardian newspaper. which had obtained them through public records requests. They indicate that Ducey's staff worked closely with the company as it began experimenting with autonomous vehicles that the company began testing on public roads in August 2016 without informing the public. The governor's staff pushed back, saying Ducey's embrace of Uber and autonomous vehicles was one of his administration's most visible and public initiatives and that there was no secret testing. "Allegations that any company has secretly tested self-driving cars in Arizona is 100 percent false," Ducey spokesman Patrick Ptak said. "From the beginning we've been very public about the testing and operation of self-driving vehicles, and it has been anything but secret." The email exchanges fill in the gaps between what Ducey was saying publicly since taking office in early 2015 and what was happening behind the scenes as his administration helped Uber set up shop in the state and then launch its driverless car testing program. Frequent boosts In the earliest days of his administration, Ducey ordered a state agency to stop citing Uber drivers for violating the state's taxicab laws. He then pushed through a law legalizing ride-hailing services like Uber and Lyft, a move his Republican predecessor had vetoed the year before. He then issued an executive order in August 2015 encouraging and allowing self-driving vehicle testing with no reporting requirements. Over the years since taking office, Ducey took frequent opportunities to boost Uber's operations, tweeting about the company's services and welcoming its officials after they pulled their self-driving cars from California in a dispute with that state's regulators in December 2016 and shipped them to Arizona. "California may not want you, but Arizona does," Ducey said when he took the first ride as a passenger in Uber's self-driving cars in April 2017. Behind the scenes, Ducey's staff worked closely with Uber as he championed its regular service and its self-driving vehicles, allowing it to operate without permits and encouraging its testing and operation on public roads. His staff set up meetings, helped steer Uber executives to Phoenix city officials as they tried to lift an airport ban, and got the governor's office to tweet its suggested message about a new service called "Uber eats" when it rolled out. The emails show a top Ducey staffer was invited to use Uber offices for work while in San Francisco, but he didn't take the company up on the offer. The governor's office said it provided the emails to the newspaper in September. Ptak, Ducey's spokesman, defended the tweet and other efforts to promote the company. "We are proud to welcome innovation to Arizona," he said. "We often promote news of the thousands of jobs and opportunities coming to Arizona. That's nothing new." 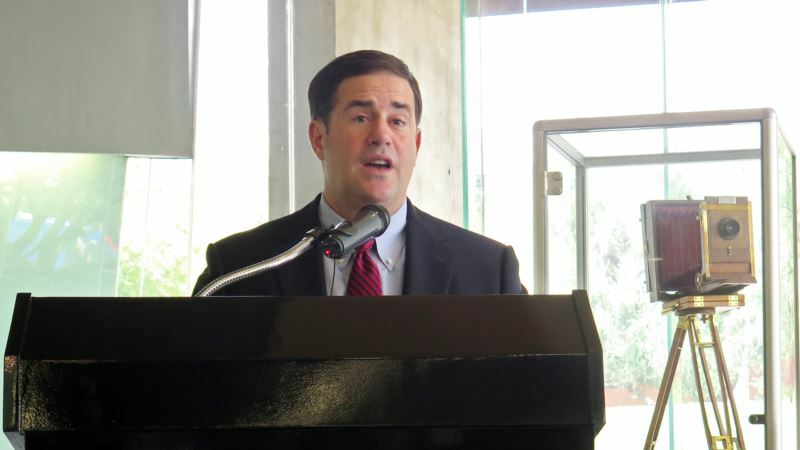 Democrats critical The Arizona Democratic Party blasted Ducey after the email revelations. "Governor Doug Ducey violated the trust of hardworking Arizonans across the state," the party's executive director, Herschel Fink, said in a statement. "This bombshell report further exposes the mismanagement by Governor Ducey and his sheer priority to put business relationships ahead of Arizona." The governor suspended the company's testing privileges Monday, citing safety concerns and "disturbing" dashcam footage of the March 18 crash in Tempe that killed a pedestrian as she walked her bike across a darkened road. Experts told The Associated Press that the technology on Uber's car should have spotted the pedestrian and the failure revealed a serious flaw. Immediately after the crash, Uber voluntarily suspended its autonomous vehicle testing in Arizona, as well as California, Pittsburgh and Toronto. The company on Tuesday decided not to reapply for the California permit "with the understanding that our self-driving vehicles would not operate in the state in the immediate future."